These make the perfect plant-based meal when you’re craving something substantial yet easy. For serving you can go the traditional route with pita and hummus, or lighten it up with lettuce wraps, fresh vegetables, and my Garlic Dill Sauce. If you make this recipe, let us know what you think by leaving a comment, rating it, and tagging your photos #minimalistbaker on Instagram. We’d love to see what you come up with. Last but not least, if you have a recipe request let us know in the comments! Several of our recent recipes (Lemon Almond Blueberry Pie Bars, Peanut Butter Overnight Oats, and Grillable Veggie Burgers) have come from reader suggestions, and we’re always happy to get creative and simplify/vegan-ize recipes you’d love to make at home. Amazing, 30-minute chickpea fritters infused with fresh herbs, garlic, and turmeric! Healthy, simple, flavorful, and surprisingly hearty. Preheat oven to 375 degrees (190 C) and add flax egg to a food processor or high speed blender. Heat a large metal or cast iron skillet over medium heat. Once hot, add lesser amount of olive oil (1 Tbsp or 15 ml as original recipe is written // adjust if altering batch size) and minced garlic. Sauté until slightly browned, stirring often - about 3 minutes. Remove from heat and cool slightly, then add to food processor or blender with flax egg. Next add panko bread crumbs, parsley, vegan parmesan cheese, sesame seeds (optional), coconut sugar, turmeric, cumin, a pinch each salt + pepper, and 1 tsp olive oil (amount as original recipe is written // adjust if altering batch size), and lemon juice. Pulse/blend until small bits remain, scraping down sides as needed. Scoop out heaping 1 Tbsp amounts of dough (I used this 1.5 Tbsp scoop from Amazon) and form/roll into balls - about 15 total (amount as original recipe is written // adjust if altering batch size). They can be fragile, so handle gently. Roll fritters in the vegan parmesan cheese-panko bread crumb mixture to coat. Heat the same skillet you used earlier over medium heat. Once hot, add enough oil to form a thin layer on the bottom of the skillet, then add fritters. Depending on the size of your pan, you may need to cook them in two batches as to not crowd the pan. Add more oil as needed. Brown fritters for 4-5 minutes total, shaking the pan to roll them around and brown all sides. Turn down heat slightly if browning too quickly. Add sautéed fritters to a bare or foil-lined baking sheet and transfer to the preheated oven and bake for 12-15 minutes. At this time, prepare any vegetables, sides and/or desired sauces, such as the Garlic Dill Sauce (link above). Once fritters are golden brown and fairly firm to the touch, remove from oven. Let cool a few minutes before serving. They will firm up the longer they cool. 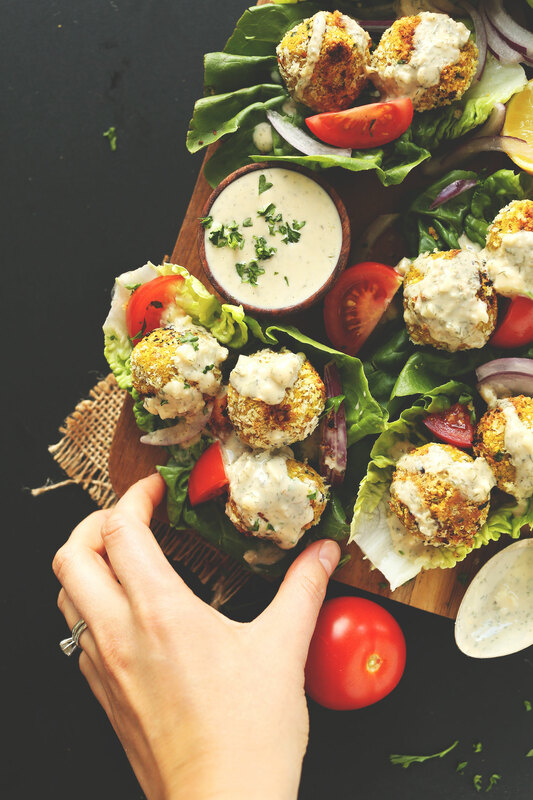 To serve, top pita or lettuce wraps with desired number of fritters (2-3), fresh tomato, onion, parsley, and sauce. Leftovers will keep in the refrigerator for 3-4 days, though best when fresh. Reheat in a 350-degree (176 C) F oven until warmed through, or in the microwave. To freeze, sauté fritters as instructed, then transfer to a baking sheet and freeze until completely firm. Then transfer to a freezer-safe bag or airtight container and store in the freezer for up to 1 month. Reheat in a 375-degree F (190 C) oven until completely warmed through. *Recipe adapted from my Easy Vegan Falafel and Sun-Dried Tomato Basil Vegan Meatballs. *Nutrition information is a rough estimate calculated without any additional sauces/toppings. Is it possible to make these into larger patties to put on buns? Would I need to adjust anything in the recipe or just make them a bigger size? I think that would work, though we haven’t tried it ourselves! Let us know how they turn out, Carissa! And then pop them in the fridge for a few hours? So I’m not rushed before everyone comes over? I made these this evening. I actually made 10 slightly larger balls and they turned out great. Garlic sauce also amazing. We’re glad to hear it, Katie! I made this recipe and the batter was dry and wouldnt blend, most chickpeas were whole. I added oil and the batter turned out like a paste. I subbed the vegan cheese for the kraft parmesan powdered kind and skipped the parsley. The balls did not stay together in the pan. The batter tasted really good though. Any tips for me? Hi Sandra! Did you make the fritters using a food processor? It sounds like you may have over-mixed your chickpeas. ou don’t want the chickpeas to turn into a paste, but you also don’t want any left whole. Hopefully this helps for next time! Nope. That’s not the problem. The problem is “flax egg” doesn’t bind during cooking. Use a real egg. Making these for the fourth time. My whole family loves them. We’ve enjoyed them over salad with your vegan ceasar dressing, and also put them in homemade flatbread with veggies for something more filling. I have a bunch of fresh dill from our CSA this week so I’m going to give the dill sauce a try this time. Our family of 5 has been eating plant-based for 1 1/2 yrs. and without your recipes we would be sad! I also frequently cook from “Everyday Cooking”. We appreciate what you do! Turmeric Chickpea Fritters of every country has their own special flavour. thanks for your post I know more about it. This recipe looked good and had such a high rating so I thought I would give it a try. I’m perplexed that so many people liked them. After nearly giving up on them trying to mix them in the blender as described, they literally disintegrated in the pan to a layer of mush. I’m disappointed…and hungry. Same here. There is nothing to bind these together. They just fall apart into mush. These were delicious. Since I’m vegetarian, I used a hen egg and found it worked very well. Since I was making chicken souvlaki for the meat eating part of my family, I had these with tzatziki and Greek salad. So good! Thank you. These look fabulous, I can’t wait to try them out. I’ll report back when I do as I’m adding this to my pepperplate as I speak! I made this recipe for supper this evening. These fritters are delicious! My partner even declared that, had she ordered them in a restaurant, she’d go back time and time again, they’re that good. For some reason, my tummy revolted at the thought of parmesan and cumin, so I left the parm out and added a bit more panko to keep the ratio of dry to wet ingredients the same. I didn’t feel like they were missing anything so will likely continue to make them this way. Just made these, literally eat a pipping hot fritter out of the oven! i love these! Great recipe. Hmm, I think fresh is more pungent, so start with 1/2 tsp grated! Just tried this recipe for dinner, it was absolutely delicious and very filling. I didn’t make the dill sauce but I think it would have improved the fritters. Thank you! Yummo. It looks great I can’t wait to try it! These are so good – I’ll definitely be making again! I made a few changes – chia egg, no oil, just 2 cloves of garlic, nutritional yeast instead of the vegan parmesan, upped the turmeric to 1 tsp and skipped the pre-frying part and just cooked them at 240C in the oven – they turned out amazing, super crispy on the outside, very easy to shape and not at all crumbly and a delicious finished texture and flavour. HEY?! Have you succeeded using chickpea flour for a base for recipes? I’ve made a sauce with it, but I feel sure it can be used as a smooth recipe main ingredient! This is another Minimalist Baker recipe that does not disappoint (actually, I’ve never found one I didn’t like yet)! I was so happy to find that I had EVERY single ingredient in my house already (I must be a vegan cook, right?!) =) I made these exactly as the recipe states and LOVED them. I’m trying to cut down on carbs and putting these on lettuce wraps was perfect and I didn’t even miss the bread. I had them for dinner last night and then lunch again today- and I swear they taste even better the next day. Thank you! Just put these on this week’s meal plan! Love your blog and how simple the recipes are, I tell everyone about it. As a request, I am always looking for something salty to eat during the day and I usually grab cheese as my “healthiest” option. Do you have any healthy savory snack ideas? They sound delicious. Please be aware that some brands contain uncertified palm adding to the destruction of the forests in Indonesia and the habitat of orangutan. I made these fritters tonight with the garlic dill sauce stuffed into your Garlic Herb Flat Breads. We served it with cucumbers, tomatoes, arugula/baby spinach and red onion. There were NO leftovers! I made a version inspired by your post today. I must say they were amazing. I didnt do vegan I used an egg and parmesean cheese. For binding I geound up a variety of nuts till it was a powder for fun and added some shallots, garlic, smoked paprika and cooked them in clarified butter. Paired them with butter leaf lettuce, micro greens, cilantro and a greek yougurt dressing I added tumeric too and sprinkled so chili flake on top too. I wanna say I am new to being a vegetarian and your blog is just so amazing. Ive tried a couple other dishes and I have enjoyed each one. Your recipes are easy to follow and your pictures inspire to want to cook as beautifully and tasty as you do! Thanks You! We made these little fritters tonight and they are so good! They are also fun to make. Even my 3-year-old helped roll the balls. :) My only complain is about my not-so-powerful blender. Poor blender worked very hard, but not good enough to crush all the chickpeas. I found that if I blend them first separately, it’s easier. I had to manually break them with a spoon. That being said, this falafels are yummy with the veggies! I also copied your presentation with the lettuce wrap and impressed husband. Ha. Very gooood! Added cayenne pepper to the dough and served in pita bread with lettuce, tomato, raw onion, tzatziki, baba ghanoush, lemon juice, and fresh dill. I could eat this every day! I made these last night and they were wonderful! I used a regular egg and regular Parmesan cheese since I’m not vegan and it was fantastic! I was so lost in the combination of flavors I forgot to take pictures for IG, whoops! Next time. I can’t wait to make this one again. It will definitely become a regular meal in my household :) Thanks Dana! Is it possible to bake in the oven? I have tried a lot of your recipes since I discovered your blog (about 2 weeks ago) and they were all delicious (mmm eggplant roll-ups), BUT this one is my favorite one! I’ve been on a real chickpea kick lately and this was absolutely perfect for that. I had mine with some tahini sauce. Yay! So glad you enjoyed it, Seia. Thanks for sharing!! Nothing wrong with being on a food high! I was once on a BIG sweet potato high, then nice cream high, then chocolate high, and now I’m basically on an anything-fall high! These fritters look better than ever! I would like to ask–do you have a satay recipe? I love tofu–especially satay style! It would be awesome if you can make it! I really appreciate this recipe! For me, it took a good deal longer than 30 minutes–which I was expecting (and I move briskly in the kitchen). More like an hour and change, but still a fun recipe to try. The ‘dough’ clogged my food processor, so I went into hand mashing mode with a potato masher. It was tricky getting the balls evenly browned in the pan without burning, and I did have some fall apart after cooling post-oven. All this to say; I look forward to fine tuning this recipe and making it a staple. Love the faux parmesan and the dilly dressing! Thanks for sharing, Hugo! The amount of time you bake them will vary, as you found out. I like them a little tender, so found 20-ish minutes was good. Glad you enjoyed them! This recipe was delicious! I substituted regular parmesan cheese (couldn’t find vegan!) and used low fat yogurt for the dill sauce; even my boyfriend enjoyed these! Keep them coming. Can you do more overnight oat recipes? I loooove the pb overnight oats! These are so good. I found it took quite a bit longer than 30 minutes, but worth it. The garlic dill drizzle is so easy and absolutely necessary. Perfection. In the realm of suggestions for future recipes: gluten-free gingerbread cake. The recipe I’d been using has xanthan gum, and I haven’t had time to play with your three-flour method to remake it in a more healthful form. Also, this might be the most unnecessarily wordy comment your blog ever receives, and adding this sentence hasn’t helped in that regard. Made this last night. Bursting full of flavor. Whole family kids included loved it. I made a cashew vegan aoli to go with it. So good. We’re a family of meat eaters, found your awesome site and you’ve inspired me to try more plant based foods. Thank you! This didn’t blend well in my blender, so I switched mid-prep to my food processor, and it was less than a minimalist prep process. However the end result was delicious, and my husband and I enjoyed the fritters on top of a salad with feta. I didn’t have dill, so I made a yogurt dressing flavored with lemon and garlic that I used for the salad and as a dip for the fritters. It was a filling and tasty dinner. My hubby liked how the fritters were crisp on the outside, tender inside, and not overly crunchy and hard like some falafel. We’ll be making this again, so thank you! Can I substitute granulated sugar for coconut sugar? Hi- can you substitute a real egg for the flax egg? Hey Dana! Made these last night and they were nothing short of amazing. I’m such a fan of falafel and your dill sauce compliments so well. I want you to know that I used a recipe from a different source the other night for a Moroccan dish. I think I’m spoiled by your site, because I found myself frustrated with their instructions and the dish was an overall disappointment. I trust your recipes and am always excited to try them. The photos are wonderful too in helping me know what things look like. Anyways, keep it up and thank you for sharing your passions and talent! I would love to see you come up with a vegan breakfast sandwich. If anyone can do it, it’s you, Dana! Ah, thanks! Added to my list! Hi! I just discovered your site through Bloglovin’ and I am very excited to go through your archives. Thanks for a great addition to the favorite recipes list! Hi, I lived in Israel for a few years, so I really appreciate a good falafel! I will give these a try. In israel, they are mostly from raw chickpeas, then deep fried, which cooks them. I wonder whether you can do that in a pan. I know it works for baking them – there is a wonderful Restaurant in Tel Aviv named Abba Gil that makes falafel that way. Also, they generally serve pickled/fermented vegetables there with falafal. Sooo healthy – i wonder whether you could create a recipe gor that?! Yum! I’ll definitely look into that! Thanks, Gila! Ok Dana, I’ll give you a recipe request! Lemon cake. It’s my favorite and I make it for my birthday every year, that is until I became vegan a couple years ago. I’ve searched high and low for a vegan lemon cake that will satisfy this aficionado, but can’t find one that satisfies my taste. I love lemon. Lots of lemon. Would love to see your take on this! Ooh, yes! It’s my favorite, too! Officially on the list. We made this recipe tonight, including the Garlic Dill Sauce and Vegan Parm, and it was fantastic! Two enthusiastic thumbs up! Very flavorful and healthy! I loved your recipe for vegan ramen the other day! Are you into vietnamese food at all? I am crazy about it but find it hard to create vegan variations recipes at hope – such as Pho or rice noodle salad or this divine red curry with tofu, brokkoli, green beans and carrots they serve at a restaurant I know… I would admire you forever if you pulled one of these off! I love pho! I’ll add it to my list! This recipe is so cool ! and so quick, I love it. Thank you so so so much for sharing it ! I just made these tonight and they were delicious! Really quick and easy to make and my boyfriend also enjoyed them. I used just nutrional yeast instead of your vegan parmesan and also more turmeric and the flavor turned out great. Only thing is that I would’ve preferred them to be a bit more dry inside, but maybe we should’ve just waited to let them cool a bit more after taking them out of the oven (hunger levels were high though, so that wasn’t really an option). I’m really enjoying your recipes Dana, keep up the great work :)! So glad you liked them! Thanks for sharing, Rike! And yes, if you bake them and then let the cool for a bit, they will get firmer! Ever since last week when I come to this blog everything is so big! I don’t know if this was intentional or not but to be honest I’m not a huge fan :/ the layout before was much simpler and better put together. (Again this might be an issue with the computer I am using I could be wrong)Anywho I adore your recipes it just takes a long time to navigate through them due to the super large pics. Hi Amy, not sure what change you may be seeing as we haven’t edited anything on our end. Is your browser spread too wide, or are you zoomed in too closely? oh yay you didn’t change anything :) that’s what I was hoping for! I will just try and adjust the browser. Thanks so much for the reply! Well, you have given me new ways of using my canned chickpeas (yay!). Love the recipes! Thanks so much Dana, you’re sooooo amazing at what you do. Too kind! Thanks Liv. Hope you love these! 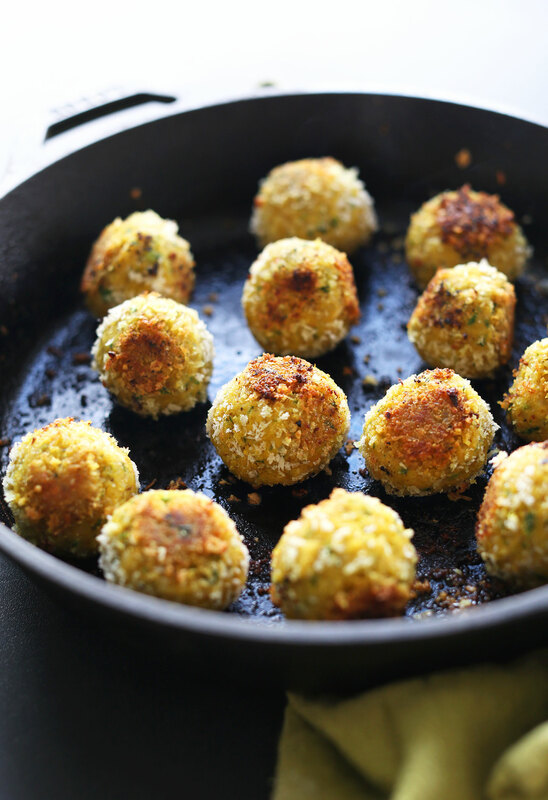 There can never be too many falafel recipes, so please keep them coming! :) This one sounds fantastic! Glad you agree! Hope you love this one, Sophie! I made these for my (meat-loving) parents last night and they loved them! Totally delicious and filling. So wonderful! Thanks for sharing, Lea! Dana, I see you often use peas and beans to create one of your kind of recipes, they are so inspiring, I seldom see recipes of how to cook various peas and beans. Can I ask a favor from you of how to cook the dry chick peas to be ready for dishes like this one you are making today? Either by pot or slow cooker. Oops! one more question: how to remove the soft peel of the chick peas before or after it is fully cooked, I had a nightmare one time I cooked the chick peas, the soggy transparent peels were mostly stick with the peas and I had to remove them one by one with fingers. It was totally disaster. Hi Edna! To be honest, I rarely cook my own beans and peas! I prefer buying them canned (organic and BPA free whenever possible) to save time! And no, I don’t remove the soft peel before using chickpeas! If some flake off, yes I remove them. But I don’t make it a point! OMG this looks fantastic!!! 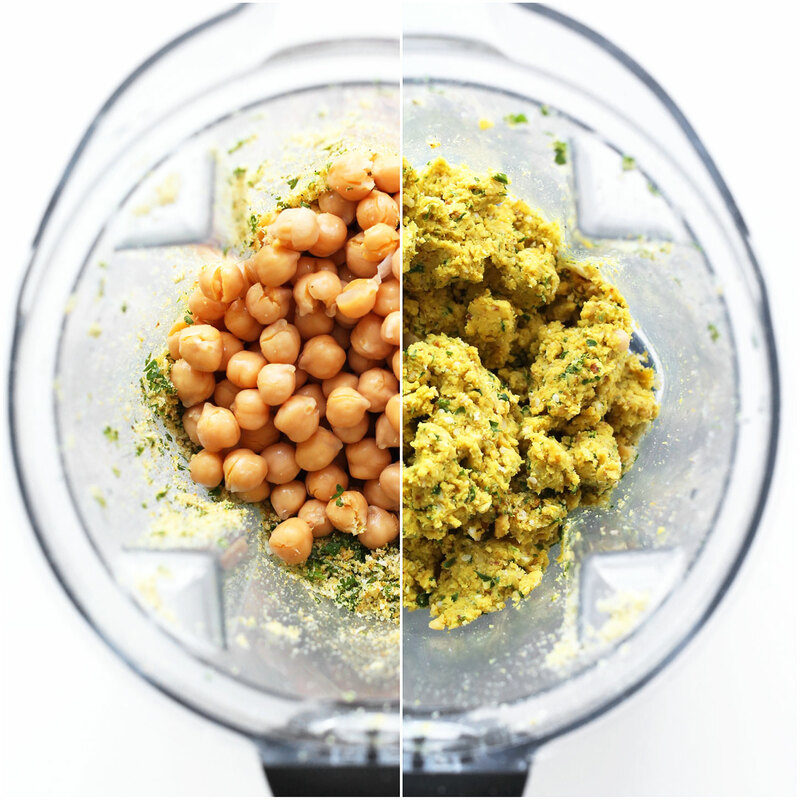 And I love that pic of the blender split in half :) Def will be trying these out soon! Thanks Mila! xo Let me know how it goes! Another great recipe that will helps use up the 10+ cans of chickpeas I have in my pantry! Lovely recipe, Dana! Whoop! Hope you loved them, Julie! This looks great, but is there a substitute for the panko bread crumbs that would be gluten free? Thanks! You can try gluten free bread crumbs! You’ve got a lot of balls lately. I just made the Sundried Tomato Meatballs…best meatballs I’ve made! Can’t wait to try these balls! I would love more sweet recipes that involve beans! And also a tofu-based vegan burger. Never found a good recipe. And a protein shake that doesn’t involve protein powder!! Wonderful! Added to the list, Mia! Hi Hannah! I’m honestly not an expert on the topic as I almost exclusively use flax eggs. Sorry I couldn’t be of more help! Yummy! These hit the mark! I would love to see a vegan recipe for cabbage rolls! I would love to see a recipe for a chocolate chip pumpkin bar! Vegan and gluten free of course! I’m seriously pinteresting all of your recipes lately. They all look amazing! I don’t even cook but your recipes are so creative and healthy I read them (for one day when I cook!!! THANKS! Hope you eventually give these a try! I love, love this idea! Turning your falafels into fritters sounds amazing and a really healthy way to satisfy my need for deep fried crunchiness. I’m imagining an arancini-type texture and interior lusciousness. Another great invention, Dana! 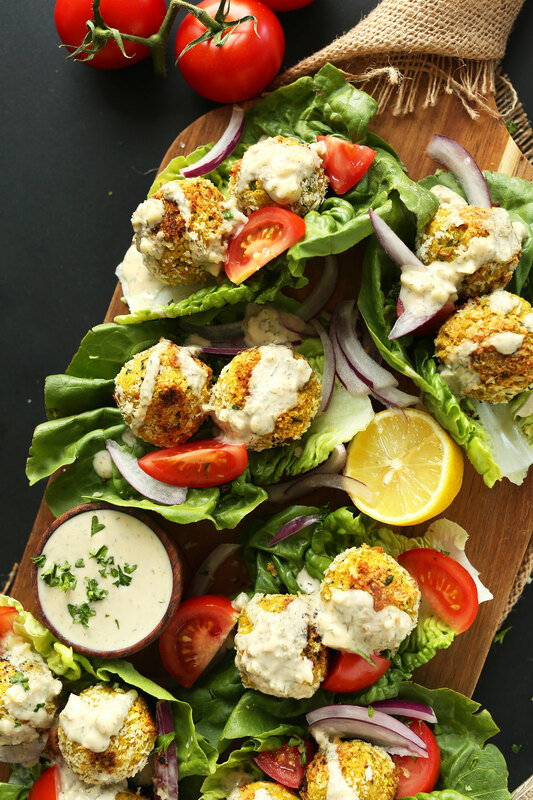 I, for one, am DEFINITELY not complaining about the falafel kick ;) You keep coming up with better and better recipes, I can’t wait to try this variation!! Haha, thanks Sarah! Glad you’re on board! Any high protein recipes I could link to on my supplements website? I totally understand you love for falafel. It’s so darn delicious! These fritters look and sound terrific. I love how crispy and colorful they are. Must try! I think you are making me fall in love with chickpeas all over again. And I’ve struggled with chickpeas in the past. Garlicky sounds awesome. And turmeric sounds super awesome. I know it has all these health benefits too, don’t know what they are, but I’m ready to whirl. That’s good news! Hope you love these, Laura! These look like the kind of dinner I should be having – quick, healthy and easy! These look amazing! I am excited to give them a try. 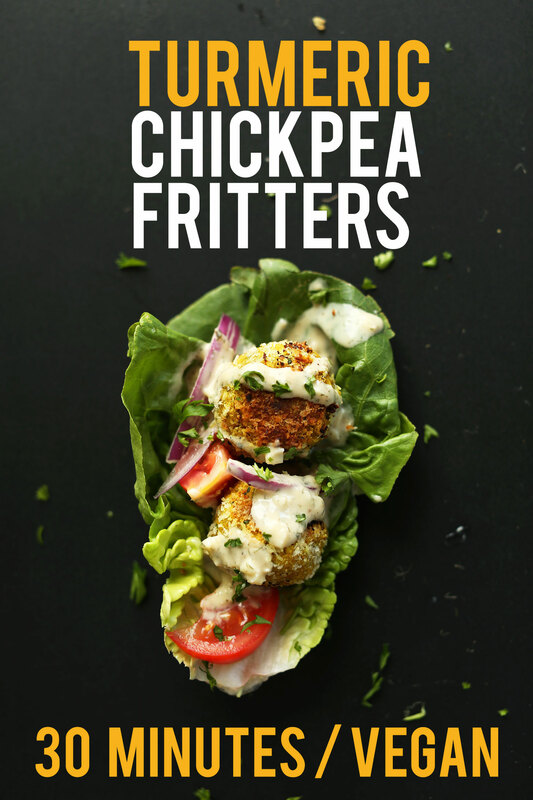 I love using chickpeas in all sorts of ways like hummus and crispy chickpeas, but I have yet to try anything like these fritters! Falafel me up [Dana]! I love this kick you’re on!! I want to try them all! What a beautiful recipe!! I can’t wait to try this out! The garlic dill sauce seems to go perfectly with the fritters! I love the addition of turmeric too, I’m always looking for more ways to consume turmeric..and this will be perfect! Glad you’re on board! Hope you love these, Samantha!